Capsule (also known as K antigen) is a major virulence factor of bacteria, e.g. all of the principal pathogens which cause pneumonia and meningitis, including Streptococcus pneumoniae, Haemophilus influenzae, Neisseria meningitidis, Klebsiella pneumoniae, Escherichia coli, and group B streptococci have polysaccharide capsules on their surface. Nonencapsulated mutants of these organisms are avirulent. Composed of polysaccharide (i.e. poly: many, saccharide: sugar). These polymers are composed of repeating oligosaccharide units of two to four monosaccharides. (Exception: The capsule of Bacillus anthracis is composed of polymerized D-glutamic acid). Capsule is located immediately exterior to the murein (peptidoglycan) layer of gram-positive bacteria and the outer membrane (Lipopolysaccharide layer) of gram-negative bacteria. The sugar components of polysaccharide varies within the species of bacteria, which determines their serologic types. Example: Streptococcus pneumoniae has 84 different serologic types discovered so far. Virulence determinants: Capsules are anti-phagocytic. They limit the ability of phagocytes to engulf the bacteria. 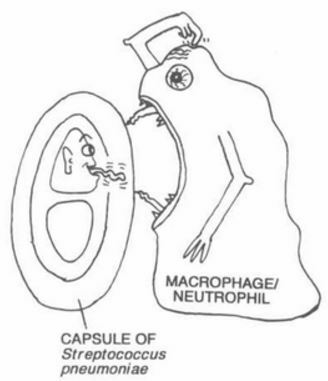 The smooth nature and negative charge of the capsule prevents the phagocyte from adhering to and engulfing the bacterial cell. If a pathogenic bacteria lose capsule (by mutation), they wont be able to cause disease (i.e. loses disease causing capacity). Saving engulfed bacteria from the action of neutrophil: Bacterial capsule prevents the direct access of lysosome contents with the bacterial cell, preventing their killing. Prevention of complement-mediated bacterial cell lysis. Protection of anaerobes from oxygen toxicity. Colony characteristics in culture media: Bacteria with capsules form smooth (S) colonies while those without capsules form rough (R) colonies. A given bacterial species may undergo a phenomenon called S-R variation whereby the cell loses the ability to form a capsule. 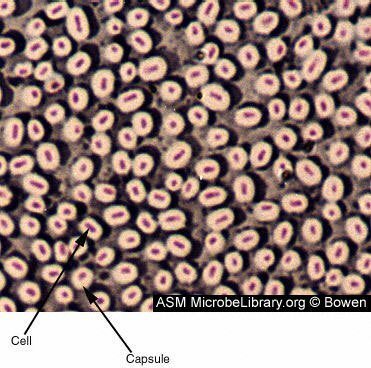 Some capsules are very large and absorb water; bacteria with this type of capsule (e.g., Klebsiella pneumoniae) form mucoid (M) colonies. Polyvalent (23 serotypes) polysaccharide vaccine of Streptococcus pneumoniae capsule. Polyvalent (4 serotypes) vaccine of Neisseria meningitidis capsule. A monovalent vaccine made up of capsular material from Haemophilus influenzae. Initiation of infection: Capsules helps the organism to adhere to host cells.The capsule also facilitates and maintains bacterial colonization of biologic (e.g. teeth) and inanimate (e.g. prosthetic heart valves) surfaces through formation of biofilms. How do the capsules contribute to a pathogenic infection? Thanks I got what I wanted. Nice.